You can search for YouTube videos above. To get the search form in any YouTube player, mouseover the 'up arrow' in the lower right corner, then click on the menu icon that appears above it. Search results appear in the player on this page. The Comoros are a group of four islands lying between the northern extremity of Madagascar and the East African coast. 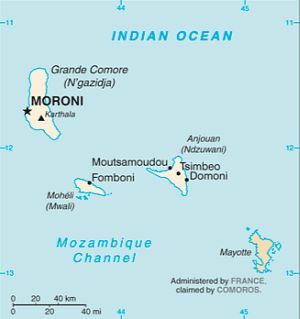 The most northerly is Comoro proper [Grande Comore, Ngazidja], an island about thirty miles in length, with an average breadth of about ten miles. Nearest to this, and a little further south, is Mohilla [Moheli], the smallest of the four. Johanna [Anjouan], lying south-east of Mohilla, and distant from it some thirty miles, is the second in respect of extent; and Mayotte, thirty miles south-east of Johanna, is third. In the year 1841 the French established themselves on the little island of Zaondzi [Dzaoudzi, Zaoudzi], near Mayotte, gaining their position by espousing the cause of one of the contending chiefs, on the condition of his ceding Zaondzi to them. It is now fortified and furnished with an arsenal, and it was at one time planned to make Mayotte a military and naval position of the first class; but the plans seem to have been discarded since the revolution of 1848. Mayotte has reef-locked anchorages extending over a length of more than thirty miles; communication is kept up with Bourbon [Palais Bourbon] by means of a small steam schooner of war, and Col. Pelly found some thousand tons of coal, besides patent fuel, stored at Zaondzi. The staple product of Mayotte is sugar; if well cultivated the island might export from 15,000to 20,000 tons per annum; but there is a great scarcity of labour. The population is stated to number about 7000 souls. The island of Johanna is a sultanat, without any direct relation with the other islands, the present chief being named Abdullah, the descendant of a family which has ruled the island for the last century. Johanna contains a population of 12,000, including aborigines, half-castes, slaves, and foreigners. A lingua franca, called the Johanna language, is current, but Kisuahili [Swahili, Kiswahili] is also spoken. The Arabic character is used in writing, no matter what the language may be, even if English. The people profess the Mohammedan religion, and are apparently quite free from the vice of drunkenness. The climate is salubrious, sea breezes and frequent showers tempering the heat. The soil is composed of the detritus of volcanic rocks and humus. Coffee thrives excellently, and will probably form ultimately the staple product of the island. The trade of Johanna is at present not large, the total value of the past year's (1860) imports being about £4500, and it is carried on chiefly with Zanzibar and the French settlements at Mayotte and Madagascar. Mohilla is governed by a queen related to the royal family of Madagascar. The island has a population of about 4000 souls. Of all the Comoro group Comoro proper is the most remarkable for the magnificence and wildness of its scenery. From its surface rises an active volcano, 8000 feet in height, which frequently vomits forth streams of lava, which flood its flanks and form new promontories and islands in the surrounding ocean. When the English consul, Mr. [William] Sunley, visited the island after an absence of four years, he found a lava reef three quarters of a mile in length jutting out near his old landing-place, and perplexing his topography. The principal town is Maroni [Moroni], but the island is partitioned among many chieftains, who are jealous of their land and water holdings. 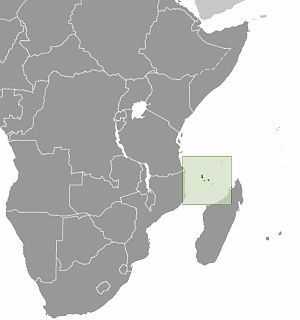 The Comoros are a group of four islands lying in the northern part of the Mozambique Channel, between Madagascar and the opposite coast of Africa. They are all of volcanic origin, and probably of quite recent formation; but only one of them (Great Comoro [Grande Comore, Ngazidja]) is now an active volcano, the other three (Mohilla [Moheli], Joanna or Anjuan [Anjouan], and Mayotte) being in a quiescent state. The great western current from the Indian Ocean which sets round Cape Ambro [Cap D'Ambre], at the northern termination of Madagascar, impinges with full force on the Comoros, and then passes down the Mozambique Channel at a rate of ninety miles a day in some parts, but varying according to the strength of the prevalent monsoon. It thus appears to have come about that the Comoros have been peopled with life from Madagascar, and that but very few African forms have as yet reached them. The vegetation of the Comoros is, as I am informed by Dr. John Kirk [Sir John Kirk 1832–1922], entirely that of Madagascar, but with an admixture of Indian weeds, such as are found in the Mascarene Islands and in other spots subject to the eastern monsoon. The only exception noted by Dr. Kirk to the Madagascarian facies of vegetation was in the case of a species of Clematis. Of this genus an African species was common in the Comoros, and the corresponding Madagascarian species was not noted there. In the fauna of the Comoros, as far as we are acquainted with it, the same is the case as with the flora. The mammals are few in number, but those found are all of Madagascarian origin. The Lemuridae are represented by a single species, the Lemur anjuanensis [mongoose lemur]. Dr. Peters records the existence of this animal in Joanna (whence it has derived its name); and Dr. Kirk tells me he also met with it in the same island, in the forests, at about 2500 feet above the sea-level. Several specimens of a Centetes [Tenrecidae] (probably C. ecaudatus [tail-less tenrec]) were also obtained by Dr. Kirk in Joanna; and according to native testimony, as Dr. Kirk informs me, the Centetes also occurs in Mohilla. The only other species of mammal I can record from the Comoros is Pteropus edwardsii [Pteropus livingstonii] [Livingstone's flying fox, Livingstone's fruit bat], which was obtained by Dr. Peters [Wilhelm C.H. Peters, 1815–1883]* and by Capt. Speke [John Hanning Speke]** in Joanna. All these three species are strictly Madagascarian and not African forms. With regard to birds, as we shall see further on, nearly the whole of the recorded species are Madagascarian. Reptiles, Dr. Kirk tells me, are almost unknown in the Comoros. A large Crocodile (perhaps Crocodilus [Crocodylus] vulgaris***) waa recently cast ashore at Joanna, but destroyed by the natives before it had reached the marshes. "GRAND COMORO is the largest island of the group, the nearest to Africa, and the most northern. In 1858 it was an active volcano; and a stream of lava, which flowed from the eastern side, covered a rich valley, and passed into the sea, where it altered the outline of one of the harbours. On this island there is not much cultivated land, the volcano, a rounded peak probably 8000 feet high, rising directly from the shore. Unlike the other islands, Grand Comoro is bare, and, seen from a few miles' distance, appears destitute of the damp forest which clothes Joanna. Grand Comoro has not been visited by naturalists, and of its productions nothing whatever is known. The inhabitants are said to be constantly at war with one another, and inhospitable to strangers; they seem to be of more purely African blood, and to have less admixture of Arabic race, than those of the others of the group. As servants they are much esteemed at Zanzibar, and their language and features are those of the common people of the other islands, who are by no means either fierce or warlike. Their language is very nearly allied to the 'Makoa' dialect of the continent of Africa, which belongs to the system of South-Equatorial African languages. The introduction of Hova blood from Madagascar is of very recent occurrence in Grand Comoro, and has not yet in any respect modified the people. "The next island of MOHILLA is the smallest of the group. As in the others, its rocks are formed of a volcanic lava, more or less spongy or compact. There are several good flat pieces of land on the island, suitable for the growth of cane; but the people are in a degraded state, with a dominant aristocracy of emigrant Malagasies, who have converted the island into an entrepot for the slave-trade. Cocoa-nuts and rice are cultivated, and the hill-slopes afford timber of considerable size; but there does not exist the damp primeval forest which clothes Joanna. The main peak of Mohilla is only about 4000 feet high, and therefore catches very little moisture. A few birds were obtained while we touched at this island, and a considerable number of plants. The Mammalia spoken of by the people were the Centetes, called by the same name as in Joanna, 'Landa,' and a large frugivorous Bat. The latter was extremely common, during the day hanging in dark masses on the branches of shaded trees. Their food was principally wild figs and the fruit of the Vitex. Their flesh is extremely good, tender, and well-flavoured. Pigeons of several sorts were seen; and a dark Parrot (Coracopsis comorensis [Greater Vasa Parrot]), Bee-eaters (Merops superciliosus), and a small Kingfisher were met with in the belt of vegetation along the coast." Joanna, or Anjuan, the third island of the Comoros, is the one with which we are best acquainted. Dr. W. Peters, of Berlin, made a short stay here during his residence in Mozambique; and, although the second volume of the 'Zoologische Reise,' treating of the birds, is not yet published, Dr. Peters's kindness in sending me a written notice of the species obtained there has enabled me to introduce them into my list. "Joanna seems to be the most humid of the Comoro group. A ridge of high land, rising in places to 6000 feet above the sea level, extends all through the island, with passes, however, across it not exceeding 3000 feet. The slopes of this range are intersected by deep ravines, and it is by no means possible to pass at will from one ridge to another. The rocks are precipitous, and overgrown with a tangled mesh of vegetation, covering deep cracks and fissures. Unstable Comoros has endured 19 coups or attempted coups since gaining independence from France in 1975. In 1997, the islands of Anjouan and Moheli declared their independence from Comoros. In 1999, military chief Col. AZALI [Azali Assoumani] seized power in a bloodless coup, and helped negotiate the 2000 Fomboni Accords power-sharing agreement in which the federal presidency rotates among the three islands, and each island maintains its own local government. AZALI won the 2002 presidential election, and each island in the archipelago elected its own president. AZALI stepped down in 2006 and President SAMBI [Ahmed Abdallah Mohamed Sambi] was elected to office. In 2007, Mohamed BACAR effected Anjouan's de-facto secession from the Union, refusing to step down in favor of fresh Anjouanais elections when Comoros' other islands held legitimate elections in July. The African Union (AU) initially attempted to resolve the political crisis by applying sanctions and a naval blockade on Anjouan, but in March 2008, AU and Comoran soldiers seized the island. The move was generally welcomed by the island's inhabitants. "Higher up a dense forest of great trees, hung with ferns and lycopodiums, clothes the hills. The soil consists of damp, decaying vegetation, the shade being too damp to allow of grass. These are the haunts of the Lemur anjuanensis, which may be found in pairs, of a cold morning, rolled up in a ball, perched on some branch. The Parrot peculiar to these islands and a large, plump, solitary Pigeon are also found in these forests. The latter is a fine bird, making a good appearance on the table. The Centetes runs about among the rotten branches in search of insects. The Centetes is strictly a nocturnal animal; but in the daytime, with the assistance of a dog, may be found easily, as it hides under a leaf or a log of wood. Sometimes, when started, it makes off with a number of young ones in a line after it. It is not at all fierce, but, when caught old, is rather dangerous, giving a nasty wound with its long tusks. The young ones, however, soon become quiet, and, on board ship, are extremely useful, devouring at night great numbers of cockroaches, and remaining concealed during the day. Both old and young Centetes, however, eat fruit as well as insects, and are very fond of flesh. "Mr. W. Sunley, H. B. M. Consul for the islands (resident at Joanna, where he owns a large sugar-estate), informed me that some carnivorous animal exists on the island. While Dr. Dickinson lived there, one was obtained for him; but, being allowed to get loose, it killed in one night several of his fowls. A Rat, with a musky odour, is also a great annoyance in Joanna, tainting wine, sugar, and anything it may pass over. In the rivers of Joanna are four or more species of fish, which offer sport to the angler; but the streams are small. In the marshes an Eel is found, differing from the species in the streams. In the forest and near the sides of the mountain-torrents a large Land-Crab is said to exist, but to be rare. A Cyclostoma picked up proved to be of the division peculiar to the Mascarene Islands, Madagascar, and the Seychelles. "A small hill-tarn, 2000 feet above the sea, named Zalanza, the head of one of the ravines shut off by a transverse dyke, contains a bird and fish reputed to be sacred. The people (uot the Arab portion) annually make a visit to the lake, and certain rites are performed. It is difficult to get them to conduct strangers thither, and such persons are commonly made to leave their arms behind before descending to the water. The people speak in an under tone when looking at the lake; and upon the occasion of our visit a small earthenware altar, on which incense had been burned, was seen under an old tree. Our desire to visit the spot arose from stories regarding the sacred bird, which was stated to be wingless. Once there, we stuck to our guns, and were successful in deciding that the wingless bird was no other than a small Dabchick (Podiceps, sp. ), very like the one found on the mainland near Mozambique. The fish we did not see; and being unprovided with rod and line, we left the second divinity for future explorers to investigate. On the lake were seen also several Ducks, but none were obtained." * Zool. Reise, i. p. 23. ** See P. Z. S. 1861, p. 268. *** This species was recently received by the Zoological Society from Madagascar.